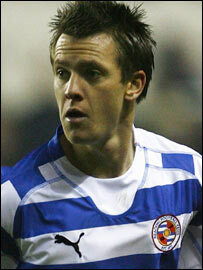 It is fair to say that Reading defender Nicky Shorey made it to the Premiership the hard way. The 25-year-old left-back has played in all four divisions since starting out as an apprentice at Leyton Orient in League Two in 1998. But few would argue that he looks at home in the top-flight - and the calls for him to be handed England recognition are getting louder by the game. Not only is Shorey a dependable stopper, he has pace and ability on the ball going forward, possesses a mean shot and is a danger at set-pieces to boot. Yet probably the most important weapon he possesses is a level-head - perhaps thanks to his grounding in the lower leagues - and there is no danger of him getting carried away by talk of England. Is Nicky Shorey good enough for England? "Obviously everyone wants to play for their country, I'd be lying if I said that I didn't," Shorey told BBC Sport. "But I think it is a bit premature at the moment. "I think the Reading fans started it all off and it is really nice when they appreciate it if you are doing well but I don't really listen to all that. "It is just one of those things - if the team is going well and you are doing well then you are going to get praised - but I'd stress that it is a team thing here, that is what is behind our success. "The manager tries to keep our feet on the ground. We let other people talk about Europe and things like that - all we are worried about is the next game." That team ethic is typical of the Royals - who have been schooled by Steve Coppell to rate group success above individual achievement. However Shorey admits he often has to pinch himself when he thinks about his career trajectory. He moved up a rung when Reading signed him for £25,000 to bolster their League One campaign in 2001 - a deal Alan Pardew still rates as his best pound-for-pound signing. Promotion to the Championship came a year later and, after a few near-misses, the Royals secured their place in the elite last season. "During some of my early days at Orient the Premiership seemed a long, long way away," he added. "But I always thought I could play at the highest level - I believed in my ability and what I could do on the pitch. "You have to keep the right attitude and need that little bit of luck to go with it - and I was fortunate to get that with my move to Reading. Thankfully I haven't looked back since." Shorey is not the sort of player that needs to bring himself back down to earth but the fate of one of his former team-mates in Orient's youth teams, Simon Downer, is proof of how fickle football can be. While Shorey was scrapping to establish himself as a full-time pro, centre-back Downer made an instant transition to the O's first-team and after being watched by a host of scouts was taken up to Newcastle on trial by Sir Bobby Robson. But he was sidelined by a succession of knee injuries and was out of football altogether for a year after being released by Orient in 2004. Downer, also 25, is now rebuilding his career with Grays in the Conference and Shorey said: "I am still in touch with Si and it is good to see him bouncing back. "He was out of the game for a long time with injuries which didn't help and when he got let go by Orient it really hurt him." And although Shorey is now plying his trade among the game's elite he has not forgotten where he came from. "What happened to me showed you can achieve something if you keep working hard. "We have got a lot of that type at Reading - people who have worked their way up from the lower leagues - and it is a credit to the lads here that we have all done so well together. "It is nice to see that people can still come from nowhere - and for Reading to have given us our chance."